Ron finished his CH (and SVCH/Supreme Versatility Championship) at 12 1/2. He earned 10 points/ 2 majors after he turned 12. Ron is very enthusiastic (perhaps a little pushy even) I enjoy training and working with him because of his love of working and desire to please. 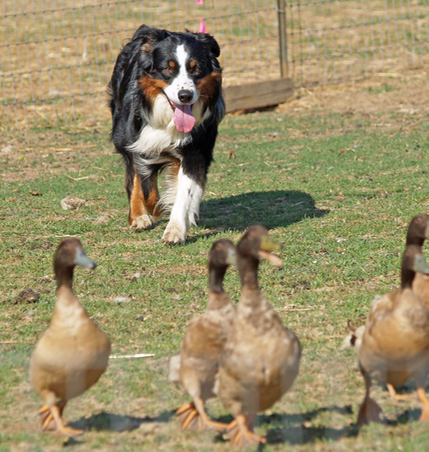 We enjoy competing and have had success in Conformation, Agility and herding. Ron finished his ATCH at Mid South ASC's agility trial May of 2008 earning several HIT veteran and Aussie awards, as well as qualifying for ASCA agility finals. He earned the last cattle leg for his WTCH Feb, 2009 at FCASC's trial in Ball Ground, GA. In Georgia Nationals (2005) Ron was 3rd in MVA out of 87 dogs/34 qualifiers! March 2012- Ron earned his 3rd ASCA 3 point major and needed 1 pt to finish. He earned 2 majors/8 points as well as numerous RWD after he turned 12. Thanks to Carol for her faith in him and for handling him to many of his points. July 2012 Ron finished with 2 pts and BOS under Sharon Rowe at TDASC's show in Iowa! At 15 1/2 Ron still enjoys playing fetch. He does love visiting with his (barn) cats. For more photos of Ron see his album.